“With the reduction of Montreal, a demand will be made upon the United States for a formal recognition of Canada, whose name will be changed at once to New Ireland." The origin of the term “Fenian” comes from the Celtic “Na Fianna.” This mythical band of fierce warriors was charged with protecting Ireland at all costs. Their principles of bravery in the face of injustice and freedom for the oppressed of their homeland complimented the beliefs of the 19th century Fenian movement. British negligence during the Irish potato famine in the 1840s and their long history of control and abuse over the Irish people fuelled resentment and the rise of movements such as the Irish Republican Brotherhood in the 1850s. 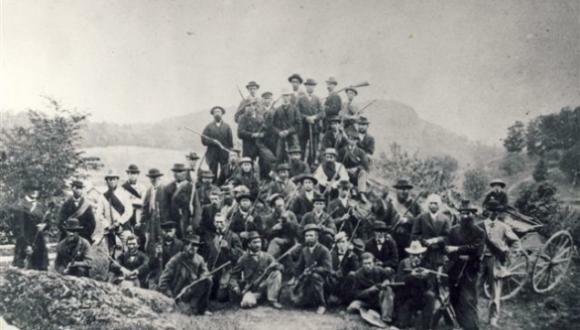 In 1858, similarly outraged and displaced Irish immigrants in America found a voice and refuge for their frustrations in the newly formed “Fenian Brotherhood.” The rumours that the Fenians were in favour of armed rebellion were not unfounded, as they quickly gained arms, money, and popular support from the large Irish neighbourhoods in cities such as New York and Boston. That the Fenians planned to attack Canada was probably one of the worst kept secrets of the decade. In the Ottawa Times less than a month prior to the raid in Frelighsburg, Quebec, it was reported that, “the Fenian circles are at this time intensely excited with regard to the opening campaign of the Brotherhood against Canada and the British Provinces.” Indeed, it was known that one of the bases of operation for the Fenians would be “close to Lake Champlain” and that the Fenians had weapons, financing, transport and enthusiastic support. It was generally believed in Ireland that an armed uprising on native soil would not be successful as the British had “garrisons in every town, village and hamlet, great iron-clads stationed in all of the main harbours”…and “the whole militia of England that could overthrow Ireland in one week along with 12,000 police, Orangemen and Protestants” at their command. It was not totally unexpected, then, when on June 7, 1866, several hundred Fenians crossed the border into Quebec under the command of West Point-educated General Samuel P. Spear. Several unidentified men were seen on the road near Eccles Hill and it was assumed that they were an advance guard of the Fenians. The alarm "the Fenians are coming” spread through the area with tales that they had captured a passenger train. Anxious farmers tore up railway lines at Stanbridge Station and homes and farms were abandoned. When General Spear crossed the frontier with his men carrying the Irish Green flag, his victory was assured. at the St. Armand frontier on the night of June 10th 1866. It does not appear that the Fenians had a particular plan of what they would do once they had crossed into Canada. General Spear had been promised 12,000 men and supplies for marching to Montreal but in the end, the ranks only swelled to several hundred at best. Many men who had arrived at the Canadian border remained in Vermont, as they did not arrive with guns. After having crossed the line and not engaging in battle, the Fenians grew restless and undisciplined. Eager for action, they occupied their time by looting stores and homes and stealing livestock. The stories of looting and property damage were enough to appoint a government commission to determine the extent of the losses and to make financial compensation to property owners. One such report concerning a marauding band of Fenians came from a Miss Caroline Tittemore of Cook’s Corner. She had closed up her house and went to stay with a friend in Frelighsburg for safety during the raid. A party of Fenians came into the yard of her friend and she instantly recognized a quilt from her own household wrapped around the shoulders of a Fenian. She rushed out of the house and pulled it away from the soldier much to the amusement of his fellow comrades. Her sense of indignation at seeing one of her lovely quilts on the back of a ruffian certainly overshadowed her sense of fear. Once the Fenians received word that Canadian militia and volunteers were advancing toward their position, they retreated. There was really nothing left for them to do but draw back as the reinforcements, arms, provisions and munitions that had been so liberally promised, had failed to reach them. As they went, many discharged their rifles into the air, threw away their sabres and munitions and carried looted household articles with them. At the border they were met by American troops who disarmed them and placed them under arrest. Upon arrival on the American side of the line General Spear and his staff surrendered and were taken to St. Albans and placed under heavy bonds to await trial for violation of the neutrality laws. 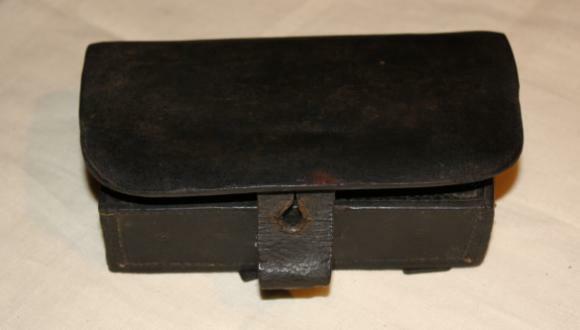 On the night of June 9, 1866 a train left St. Albans for the east with nearly 1,000 Fenians bound for their homes, while many others were left waiting in the hope that another raid would soon be organized. 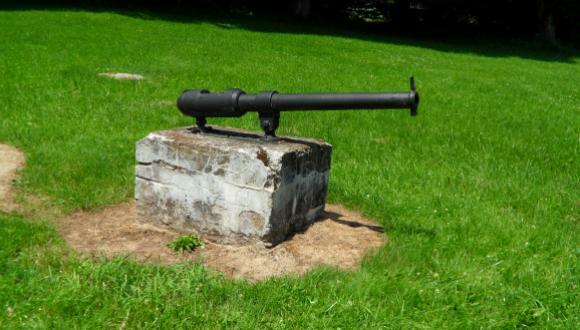 On June 22, a small party of Fenians stole across the line on a reconnoitering expedition to Pigeon Hill, and fired on the Richelieu Light Infantry sentinel stationed there. The Canadian detachment made an endeavour to intercept them but the Fenians managed to escape. The raid at Pigeon Hill was not the battle the Fenians had envisioned but the boasting of how easily they could capture Canada proved to be true. The manner in which the Fenians held this corner of Canada for a few days was less than stellar and the campaign terminated, without so much as a skirmish, because of a lack of foresight and poor lines of communication. It served however, to make the Fenian cause known and to boost their confidence that the invasion of Canada was possible. As a result of the confusion on the Canadian side, the local population was angry and disillusioned with the government’s ability to protect them. They decided to organize a home guard for their own defence. 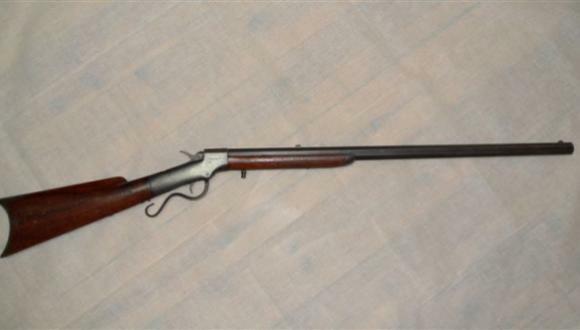 On June 20, 1868, Asa Westover and Andrew Ten Eyck of Dunham, Quebec, organized a small band of local men into the Missisquoi Home Guard called. 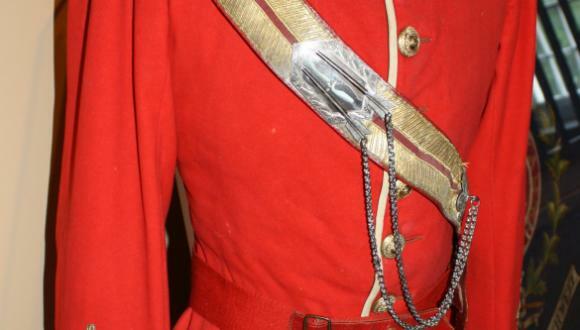 They were known as the “Red Sashes” because of the distinctive red band they wore across their chests. Although they used their own arms and ammunition initially, Westover and James Pell visited several factories in Massachusetts to determine a more suitable weapon for the home guard. 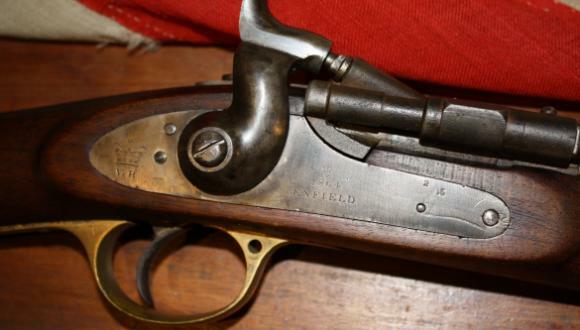 They selected the breech-loading Ballard Sporting Rifle, which was known for its accuracy. The rumours of another invasion kept the home guard alert and, along with regular drill and sharp-shooting practices, they also selected strategic positions in which to place their men around Eccles Hill should the Fenians return. “General” John O’Neill, a Union Army cavalry officer, a veteran of the Fenian battle of Ridgeway in 1866, and president of the Irish Republican Brotherhood senate, selected May 24 (the Queen's Birthday) for the second invasion. Perhaps he chose that date for the sense of drama it would make. 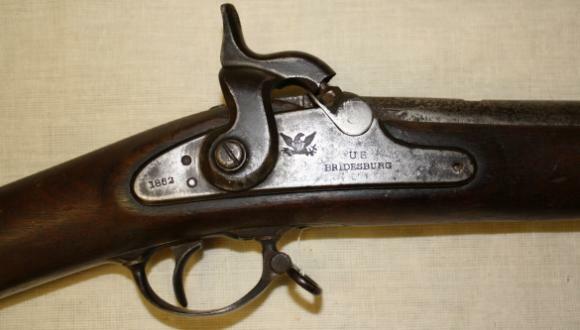 On May 23, every train bound north from New York, Boston, and the New England States, carried contingents of Fenian soldiers on their way to the appointed rendezvous at the border. The “General” established his headquarters in Franklin, Vermont, and the Fenian camp at Hubbard’s Farm, close to the town. O’Neill fully expected thousands of supporters, but once again, delays in transportation and communications meant that the forces failed to appear. Only about 800 reported for duty. Unknown to O’Neill, however, the element of surprise was not in his favour. His chief lieutenant, Henri Caron, was really Thomas Billis Beach, a British spy who reported regularly to Canadian contacts on the developing plans. In addition, Asa Westover had established a network of scouts in Vermont to give him timely warning about Fenian activity at the border. Amusingly, as the day of the incursion at Eccles Hill approached, people from the surrounding countryside arrived in wagons to view the battle. “Soldiers! This is the advance guard of the Irish-American army for the liberation of Ireland from the yoke of the oppressor. For your own country you enter that of the enemy. The eyes of your countrymen are upon you. Forward! March!" 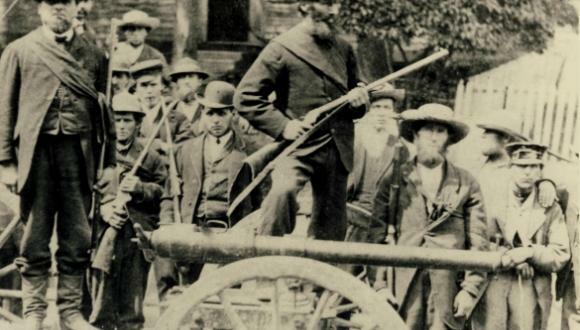 The Montreal militia which had been parading for the Victoria Day celebrations was prepared to move toward the border. 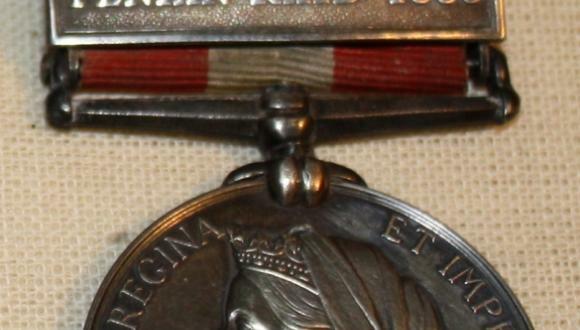 A picket of the Richelieu Light Infantry was stationed at Des Rivières (Notre-Dame-de-Stanbridge) and at Stanbridge East. 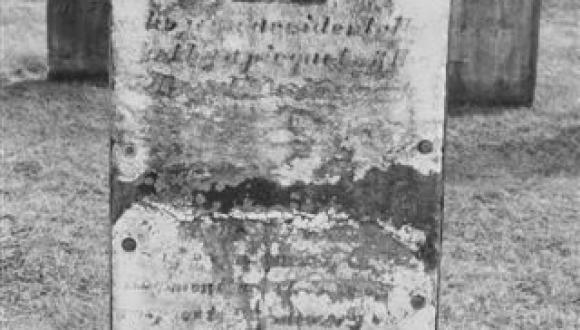 The 52nd Waterloo Battalion, located at Dunham, and the 60th Missisquoi Battalion, “accustomed to false alarms,” made their way slowly to Eccles Hill. Only about forty men of the 60th Battalion had reported for duty under the command of Lt-Colonel Brown Chamberlin. 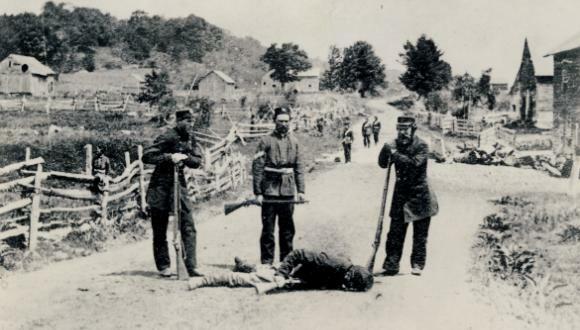 Thus, when the Fenians crossed the border after the lunch hour on May 25, the Missisquoi Home Guard were the only force to hold the border from the Fenian advance. 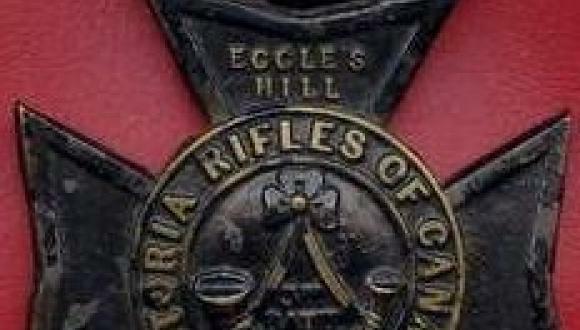 The Red Sashes were entrenched at their hidden vantage points and the Fenians never suspected that Eccles Hill was already lost to them. O’Neill took an advance guard of 200 men across the border in “columns of four with fixed bayonets” and kept the rest of his men at Alva Rykert’s farm on the Vermont side. As soon as the last man crossed the line, the Red Sashes unleashed a “withering hail of bullets from their concealed positions” on the hill. Fenian flag bearer John Rowe of Burlington Vermont, and Fenian M. O’Brien of Moriah, New York, were killed; Lieutenant John Hallinan, Captain E. Croman and Privates James Keenan and Frank Carrigan were mortally wounded. Captain Croman was a Civil War veteran who had received a first-class certificate from the Montreal Military School for militia officers. He died of his wounds a few days after the battle. Frank Carrigan of Connecticut was only 19 years old. The Fenians quickly scattered despite O’Neill’s endeavours to rally his men by shouting “Men of Ireland, I am ashamed of you.” The Canadian charge was too much for the Irish-Americans, who sprinted across the border, leaving much of their equipment behind. O’Neill himself went to Rykert’s attic to watch the events unfold and was soon taken prisoner by U.S. marshals for breaking the Neutrality Act. Although the remaining Fenians and other reinforcements were ready to take action, there seemed to be no direction once O’Neill was taken into custody. 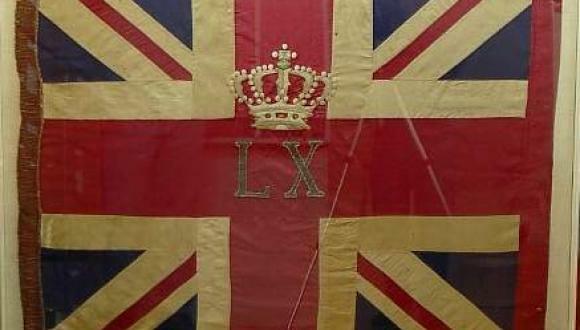 When the Victoria Rifles and other volunteers arrived to bolster the Red Sashes, there was little for the Fenians to do but surrender. An intermittent exchange of gunfire continued until the evening hours but the raid was essentially over. 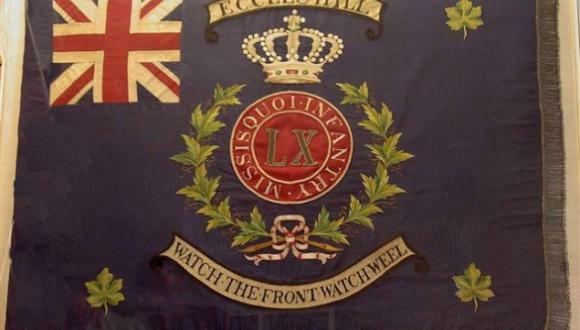 The 60th Missisquoi Battalion took possession of the Fenian field gun and the jacket of Fenian John Rowe was taken from his body to present to Prince Arthur. The incursions of the Fenians provided enough of an external threat to keep the Red Sashes on high alert for most of the summer of 1870. The few days of disruption to the normally peaceful countryside resulted in years of re-telling the stories of the Fenian raids. As time progressed and memories gave way to exaggeration, the raids were referred to as the Fenian battles or wars. By 1871, the Fenians were a spent force and the fragments of what once had been an enthusiastic organization gave up the idea of invading Canada even though they never relinquished their fidelity to Ireland. TO SEE MORE PHOTOS SCROLL DOWN AT TOP RIGHT AND CLICK! Daibhi O Croinin, Early Medieval Ireland, 1995; “Fenians in Ireland, their hopes and fears,” The New York Daily Tribune, January 28, 1866, American Catholic University Archives; John Savage, “Address of the Chief Executive and Council of the Fenian Brotherhood,” November 10, 1869; ACUA; The Fenian Raids 1866-1870, Missisquoi Historical Society, 1967; “The Fenian Plan of a Canadian Campaign”, Ottawa Times, March 13, 1866; Captain J.A. MacDonald, “Troublous Times in Canada: A History of the Fenian Raids 1866 and 1870,” 1910; Hereward Senior, The Last Invasion of Canada, 1991. P.G. Smith, “Fenian Invasions of Canada,” Military History magazine, February 2000; P.G. Smith, “War at the Border,” The Beaver magazine, November 2007.